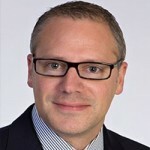 Joshua T. Klein is a partner with Fox Rothschild LLP, practicing in the Financial Restructuring & Bankruptcy Department. Joshua has completed a number of successful resolutions of complex situations involving manufacturing, technology and other business interests in and out of bankruptcy. With more than a decade of experience, clients trust Joshua for his insight and knowledge of complex financial restructuring and bankruptcy matters. 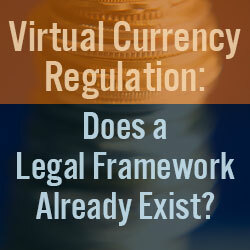 Virtual Currency Regulation: Does a Legal Framework Already Exist? There has been a lot in the media lately on the rise of virtual currencies (technical term is cryptocurrencies), most prominently Bitcoin. Bitcoin’s successes, with its astonishing value increase, as well as the trials and tribulations that it has experienced from the Silk Road issues to the collapse of Mt. Gox (which was the world’s largest Bitcoin exchange) have all garnered attention. These experiences. These experiences have left many wondering why and how the government should regulate virtual currencies. In late 2013, Congress held several hearings on virtual currencies and Bitcoin to start the long process of potential regulation. The result? Not much. Virtual currencies have purportedly been made subject to U.S. anti-money laundering regulations at the disposal of the Financial Crimes Enforcement Network (FinCEN), which is part of the U.S. Department of Treasury, and the IRS has come out and said cryptocurrencies are “assets” for tax purposes. But nothing else. Similarly, earlier this year a group of nine states announced that they are investigating the regulation of virtual currencies. New York is trying to lead the way by publicly announcing it is going to regulate it later this year. So, there is a significant amount of uncertainty in terms of the regulation of cryptocurrencies. This article posits the question of whether entirely new regulation is necessary given the existence of laws and regulations currently in place for other payment systems (yes, cryptocurrencies are payment systems as opposed to general “currencies” like fiat money). But first, it will give a general synopsis of cryptocurrencies and a brief, general overview of payment systems laws and regulations already in place in the United States. Cryptocurrency is an alternative, digital medium of exchange using peer-to-peer networking and open source software. “Crypto” means that a cryptographic protocol is used to control its creation and transfer, hence the anonymity of cryptocurrencies. By and large, most cryptocurrencies are based on (in whole or part) Bitcoin and its proof-of-work scheme for the creation of the cryptocurrencies (known as mining). Generally speaking, mining involves solving a complex math equation using the software (the work), which when solved generates the Bitcoin, broadcasts the creation to the network and generates the next equation…so on and so forth, all of which is recorded in the Bitcoin block-chain. The block-chain is a running record of ownership of Bitcoin, including all transactions. Transfers of ownership, such as using Bitcoin in a commercial transaction, are broadcast to the Bitcoin network showing transfer from one Bitcoin address (Bitcoin wallet) to another address. Due to the nature of virtual currencies, discussion of regulating them is really about regulating transactions in virtual currencies rather than the currency itself (because it is open source). Clearly, Bitcoin is the most widely known and used cryptocurrency. However, there are currently at least nine recognized cryptocurrencies in existence ranging from Litecoin (based on the Bitcoin proof-of-work scheme), to Peercoin (based on a proof-of-work hybrid), to Dogecoin (as in the dog meme). Venturing into payment systems law in the United States feels a lot like a puzzle because it’s beyond fragmented and reflects years of adding components, but never undertaking a complete overhaul. Payment systems law in the United States is split into two general components: private (between private parties) and public (involving one or more regulated entities, most typically financial institutions). On the public side, there is the Electronic Funds Transfer Act, Truth in Lending Act, Uniform Money Service Act, Expedited Funds Availability Act (a/k/a Reg CC) and the various anti-money laundering laws and regulations enforced by FinCEN. These are all federal laws and regulations, so add to it a myriad of similar regulations in each of the 50 states. On the private side, there is Article 3 of the Uniform Commercial Code (UCC) dealing with negotiable instruments, which covers everything from cash transactions to promissory notes between private parties, as well as check transactions involving private parties and financial institutions. All of these laws and regulations (this list is not exhaustive) create a framework to regulate almost all payment transactions in the United States (excluding virtual currency systems transactions). Surely within this framework there is enough to add a new payment system such as cryptocurrencies? Yes and no. The problem with current payment systems law is that, despite its purported intentions, it does not provide as much flexibility as was likely intended. The laws were established for specific reasons at a specific time. Rarely are legislated laws and regulations approved through the administrative law process forward-looking or anticipatory. Furthermore, private payment transactions falling under the gambit of Article 3 of the UCC are state-specific. Every state has its own version of Article 3, which are all largely the same but there can be subtle differences from state to state. Importantly, this also means that any modifications to Article 3 to bring cryptocurrency payment systems into the fold will require a rework of Article 3 by the Uniform Law Commission, then adoption by the legislatures of all 50 states. The last significant revisions to the UCC were in 2010 for Article 9, and in four years these changes have still not been adopted in all 50 states. Similarly, but more profoundly, state-by-state public payment systems laws and regulations are even more non-uniform and subject to greater variance from state to state. This fractured state regulatory process does leave the door open, however, to more comprehensive federal regulation of virtual currency systems, which is likely the best path forward to ensure uniformity and certainty in the virtual currency markets. For this, existing federal payment systems laws and regulations could be utilized covering everything from consumer protection, cryptocurrency funds transfers, liabilities of intermediaries and financial services providers such as exchanges (think Mt. Gox), to comprehensive regulation concerning anti-money laundering and other financial crimes involving the use of cryptocurrencies. However, the fundamental question of whether the United States government even wants to regulate virtual currencies remains to be seen.